The Dispute Settlement Body of the WTO is a modern agora for the discussion of substantive and procedural matters concerning disputes among WTO Members. Every month, Members meet to adopt reports, criticize or praise the legal reasoning developed by panels and the Appellate Body, monitor the implementation of adopted decisions, request the establishment of panels, or debate other systemic aspects of the dispute settlement system. 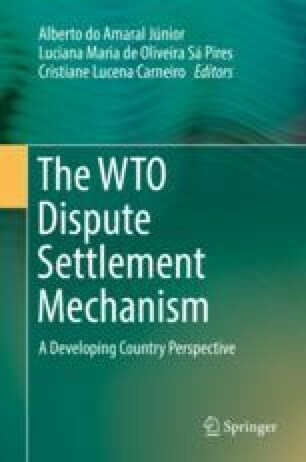 This chapter aims to illustrate the participation of a Member in that forum by providing a series of statements made by Brazil, an active user and strong supporter of the multilateral dispute settlement system. The first two sets of statements relate to the appointment and reappointment of Appellate Body members. The other set deals with the procedural issue of “sequencing” between implementation and retaliation proceedings. More generally, the three sets of statements, made by Brazil between 2015 and 2018 in the DSB, give a glimpse of some of the ongoing debates in that forum and also reflect the position of a country that is highly invested in the proper functioning of the system and in the defense of a rule-based trading system.